So I figured you were probably dying to know what I got at Costco yesterday. Above is a but a portion of our booty. 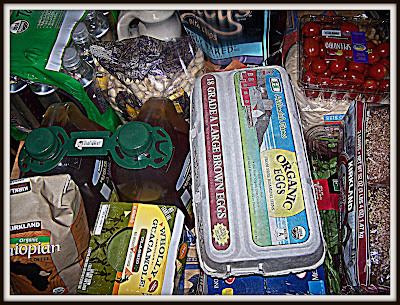 For my birthday (August 22nd, if you want to put that on your Blackberry) my very generous mother is helping me to establish a pantry of basic bulk items, such as rice, pasta, canned tomatoes, oatmeal, dried beans etc. I can use to feed my family healthier and cheaper than I do currently. We also ordered a whole, grass-fed cow to be split between my parents, my brother's family, and our own. Eventually, we would like to find a consistent source of local organic produce. Our goal is to step outside of a system that irritates me to no end. I was at Jewel (our Midwest chain of grocery stores) last week and nearly broke down in tears from spending so much on tasteless genetically modified fruit, hormone laden meat and dairy products, and high fructose corn syrup. I am T-I-R-E-D, tired of being at the mercy of an FDA who assures us that all the tampering being done to our food so that it lasts longer, looks prettier, and can travel further is A-O.K. for my growing sons and daughters. Now, I am the antithesis of a radical, but every mothering instinct I have coursing through my veins is screaming "hold up a minute, I am pretty darn certain this is not what God intended: for His children to become obese, pumped full of chemicals, and completely out of touch with the beauty and perfection of His health sustaining provisions within their natural environmental context and timetable." And with those ranting thoughts (who knew I was on the verge of a rampage? ), I wish you all a very lovely weekend filled with wholesome emotional, physical and spiritual nourishment! I want to say a special thanks to my husband's cousin, Matthew and his wife, Pam, for sending me the following link to the CSA (Community Supported Agriculture)program! I found a farm and a drop site for baskets of seasonal, local, organic vegatables within fifteen minutes of my house! If you are interested, go to their website and type in your zipcode to see what is available in your area. I have been a reader of your blogs for some time now. I always look forward to your new postings, and am really excited to hear about your book... congratulations! I will certainly be buying a copy! I love hearing how you are exploring your food choices in the context of your faith. I agree with you, in that I also find it hard to believe that a lot of the "foods" out there are what God intended for us to eat. In fact, many Saints and Church Fathers exhibited quite the opposite in the way they lived their lives simply. I am personally greatly grieved by the treatment of animals in this world, and I'm wondering if you are familiar with something St. Basil the Great said, "O God, enlarge within us the sense of fellowship with all living things, our little brothers to whom Thou hast given this earth as their home in common with us. May we realize that they live not for us alone, but for themselves and for Thee, and that they love the sweetness of life even as we, and serve Thee better in their place than we in ours." There are also two wonderful books by Joanne Stefanatos that you might be interested in reading. "Animals & Man: A State of Blessedness," and "Animals Sanctified: A Spiritual Journey." Forgive me for going on, but to find some common ground with another Orthodox Christian on some of these issues is always exciting! We too are trying to eat more natural foods. We belong to a CSA that we share with Judy's family and my parents. I have become such a label watcher and really try to avoid processed junk. We have discovered that good homemade food tastes sooo much better! Good luck on your quest! Molly, I really admire you for taking this step. I would love to as well. It's a big thing to do! Here in Australia the price of food is escalating rapidly, but the cost of organic and local is even worse, which makes it difficult for a family on one income (a rarity these days) to eat ethically. That, however, is not a good enough excuse to dismiss the idea. I am newly challenged by your story! Well, Molly. Your post inspired me to drive out of my way and shop at Trader Joe's for groceries instead. I think I just missed you yesterday at Vespers, or so I am told. Mauretta said she had a great time with you guys. Thank you so much Stephanie for that wonderful quote and for the book recommendations! I feel like I am just scratching the surface of this topic and yet the more I question my choices of convenience, the more "spiritual" the issue seems to become. I would love any additional input, especially from an Orthodox perspective! We had a GREAT time in Chicago, Miss Carrie, I would have loved to stay for vespers but the boys were melting down by that point. Wasn't shopping at Trader Joe's so more fun than going to Dominicks? It was, but I also spent a fortune! At least I can bring my lunch this week . . . healthier and a real money saver. Maybe I AM a Sabourin after all! wow, what a concept - "get out of the grocery store rut" ... monthly planning? it never even occurred to me! Wow, I could make quite a few changes too! We are taking these baby steps too...think of it has a conversion experience that will have healthy and lasting fruitfulness...a spiritual journey, indeed! Thanks for the website for locally grown produce. Deacon has been in favor of the 100 mile diet.